As all good things come to an end, so too does the Demon Cycle series by Peter V Brett, and it is a fitting end. At the outset of the story our main characters have embarked on what amounts to a suicide mission in order to take down the demon queen and hopefully bring an end to both Sharak Ka and Sharak Sun. The descent into the Core is of course only the main thread of a multitude that permeates the story, but they are woven adeptly and will satisfy most readers, including those that did not care much for the book entries subsequent to The Warded/Painted Man. Yes, Mr Brett did make some mistakes with the earlier books, but he clearly learned from those and is nearly faultless in this entry. Plot, pacing & characters – all achieve full marks with the story unfolding at a brisk pace and setting all the characters in place for the final battle, like pieces on a chessboard. While the people we have come to love and hate are all given ample page time, do not for one second think that their safety is guaranteed on account of the author’s love for his creations. Nope. This is war for the survival of humankind after all and every single character plays a pivotal role. The stakes in The Core are as high as they can be, and where fear of Alagai had diminished to a large extent in earlier books as our protagonists became more powerful, this time around the tension is ratcheted up to lofty levels as the drones and their tactics, under the leadership of the mind demons are a vastly different and dangerous beast, by orders of magnitude. A word of warning. There is no holding back in The Core. Savage. Grisly. Sickening. I am pretty sure there was more than once that my jaw dropped open. While this book clocked in at almost 900 pages, it felt like the story would still be short-changed as I came to the end. I could not see how it would all be resolved in the amount of pages left and this brings me to the only complaint I have with the book, albeit a minor one. The story was indeed successfully brought to a close, despite my misgivings. But while it was very good, it felt sudden and the epilogue imparts scant information on the fallout of the war and the survivors. Like I said, minor, but I wanted more. I am not without hope though… Brett has hinted that while this story is FINITO, he will likely write one more book in this world and it will possibly be set 15 years after the events of The Core, featuring new characters, with some familiar faces and a supporting cast. 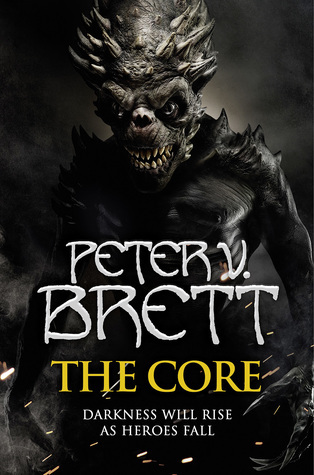 The takeaway though, is that Peter V Brett has managed to write an excellent final book that enthralls throughout and delivers, for the most part, a satisfying denouement to his debut series. I am looking forward to see what he delivers next.